From 1926, the main entrance of the Orne Library at Miskatonic University. Click through for the full-sized version. The Orne Library is the third of the "Life In Arkham" postcards. After the release of the first two I received a lot of requests for more "recognizable" locations, and this is the result. 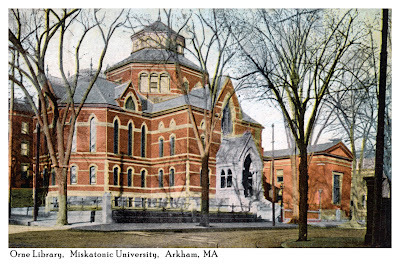 I wanted a location that would fit in with the upcoming Miskatonic University package and looked to Brown University, one of Lovecraft's primary inspirations for his fictional college, to find it. When I discovered an almost pristine 1921 postcard of the school's library I thought it would make a perfect stand-in for the Orne Library. The image here is freely available under a Creative Commons license. An actual postcard will be included with the Miskatonic package that should be (he said, crossing his fingers) available at the end of this week.